James Morgan's 23-yard TD pass to CJ Worton made it 24-21 for the Golden Panthers (4-2, 2-0 Conference USA) with 3:55 left in the game. Morgan was 27 of 36 for 311 yards, two touchdowns and no interceptions. Worton had five catches for 113 yards and a score. 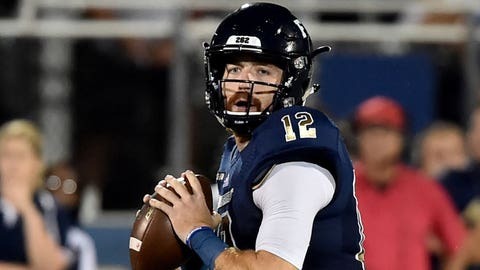 MIAMI (AP) — Olin Cushion III intercepted Asher O’Hara’s pass in the end zone with 34 seconds left, securing FIU‘s 24-21 win over Middle Tennessee on Saturday night. James Morgan‘s 23-yard TD pass to CJ Worton made it 24-21 for the Golden Panthers (4-2, 2-0 Conference USA) with 3:55 left in the game. Morgan was 27 of 36 for 311 yards, two touchdowns and no interceptions. Worton had five catches for 113 yards and a score. O’Hara converted a fourth-and-10 with a 28-yard pass that got the Blue Raiders (3-3, 2-1) to the FIU 15 before the costly pick a few plays later in the final minute. O’Hara replaced Middle Tennessee’s career passing leader, Brent Stockstill, who limped to the medical tent after the first play of the second quarter and did not return. Jose Borregales kicked a career-long 53-yard field goal that pulled the Golden Panthers within 14-13 before the end of the first half. Tavares Thomas had two TD runs for the Blue Raiders, giving him five against FIU in his career. He had three scores on six carries last year. Blue Raiders running back Brad Anderson was carted off the field in the fourth quarter.